IN THE SPRING of 2014, Donegal will play host to Ireland’s first truly attritional single day ultra-endurance event. In the space of 24 hours competitors will be required to complete 15km kayaking, 5km of fell (mountain) running, 175km cycling and a marathon and a half. In total 260 km will stand between competitors and the finish line. If that sounds like your lukewarm Thermos of tea, then The Race wants you. Created by Maghnus Collins and David Burns, the two Irishmen that recently trekked from Istanbul to Asia on an epic fundraising adventure, the route is designed to test the endurance, fitness and will of 60 brave competitors. The course takes in some of Ireland’s most spectacular and pristine landscape as competitors will do battle with Donegal’s North West coast before traversing the full expanse of Glenveigh National Park. All proceeds of event will to support the work of Irish based NGO Self Help Africa. To apply for a spot in The Race or for further information visit www.therace.ie. Email “260 kilometres in 24 hours, Ireland's toughest race wants you!”. 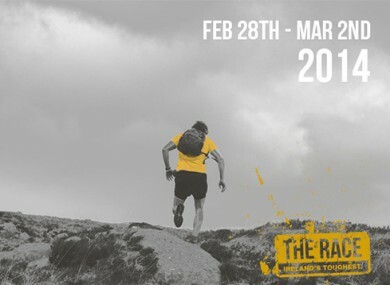 Feedback on “260 kilometres in 24 hours, Ireland's toughest race wants you!”.